Developed by industry guru and mega best-selling author Eli Goldratt, Viable Vision is a proven strategic plan and approach that lays out the steps to transform an organization's current total sales into net profits. This book explains the Viable Vision concept and provides readers the proven frame of reference and roadmap for achieving exponential growth in profits. Supported by significant testing and proven results in real companies, it is now conceivable that even large companies can grow profits at double digit rates. Concisely packed with the proven principles of 25 years of scientific research and real life application, readers will learn about the holistic implementation of constraints management in strategic planning, operations, supply chain/logistics, sales and marketing, project management, technology, metrics and finance. Whether or not you are one of the millions of people who have read "The Goal" or other fine books on the Theory of Constraints, you will gain enormous benefits from reading this book. 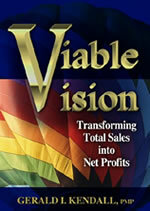 Viable Vision is a must read for anyone interested in rapidly increasing their net profits. Enables identification of your biggest leverage point for improvement and defines how each functional area must behave to execute a Viable Vision that will deliver rapid profit growth. Simplifies the holistic approach in strategic planning, finance and measurements, operations, manufacturing and engineering, supply chain/logistics, sales and marketing, project management, and information technology.